James M. Lattis. Between Copernicus and Galileo: Christoph Clavius and the Collapse of Ptolemaic Cosmology. University of Chicago Press, 1994. 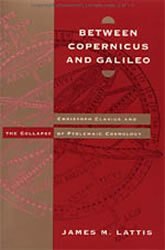 Between Copernicus and Galileo is the story of Christoph Clavius, the Jesuit astronomer and teacher whose work helped set the standards by which Galileo’s famous claims appeared so radical, and whose teachings guided the intellectual and scientific agenda of the Church in the central years of the Scientific Revolution. Though relatively unknown today, Clavius was enormously influential throughout Europe in the late sixteenth and early seventeenth centuries through his astronomy books—the standard texts used in many colleges and universities, and the tools with which Descartes, Gassendi, and Mersenne, among many others, learned their astronomy. James Lattis uses Clavius’s own publications as well as archival materials to trace the central role Clavius played in integrating traditional Ptolemaic astronomy and Aristotelian natural philosophy into an orthodox cosmology. Although Clavius strongly resisted the new cosmologies of Copernicus and Tycho, Galileo’s invention of the telescope ultimately eroded the Ptolemaic world view. By tracing Clavius’s views from medieval cosmology the seventeenth century, Lattis illuminates the conceptual shift from Ptolemaic to Copernican astronomy and the social, intellectual, and theological impact of the Scientific Revolution.